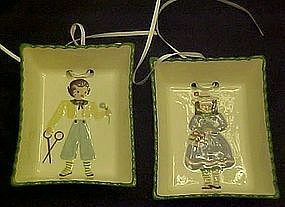 Pair of hand painted picture style wall plaques by Cleminson's pottery. Boy with scissors and flower on one and a girl with purse on the other. Each measures 3 5/8" x 4 5/8" and both are well marked and in perfect condition with no damages.